Imagination Playground, LLC, creators of the breakthrough Big Blue Blocks that have captivated schools and family centers globally, has developed a helpful fundraising guide offering a successful approach to raising money to purchase their Big Blue Blocks – and get kids playing. Schools and other educational organizations have found it difficult to solicit and be chosen to receive grant funding. Educators and parents are turning to a simpler approach – Community Fundraising. Research indicates that 80% of those who know of Imagination Playground, want an Imagination Playground. But what often stands in the way is available funding. 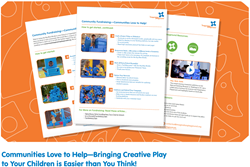 The new Imagination Playground Community Fundraising Guide provides proven tips and techniques to make a school or organizations fundraising efforts efficient and successful. To download the Imagination Playground Community Fundraising Guide, click HERE. Anyone interested in knowing more about the mission of Imagination Playground and how Community Fundraising can help you bring the Big Blue Blocks to your school, family center, or organization should contact them at 678-604-7466 or email them at contactus(at)imaginationplayground(dot)org. Imagination Playground is a breakthrough play space concept developed to encourage child-directed, creative free play. The kind of play that experts say is critical to children’s intellectual, social, physical, and emotional development. Invented by architect and designer David Rockwell and the Rockwell Group, Imagination Playground enables children to play, dream, build, and explore endless possibilities. Imagination Playground finds its home in daycare centers, kindergartens, elementary schools, children’s museums – and nature, discovery, and science centers, camps, community centers, children’s hospitals, hotels and resorts, public parks and more – in North America and over 70 countries worldwide.